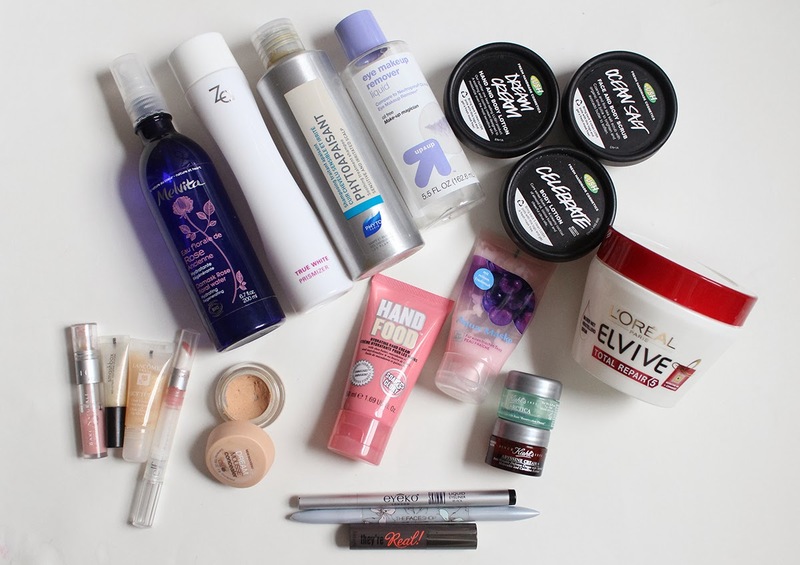 I see more and more bloggers doing empties posts now which is great to see. Not only is it a good way to share reviews of products you've thoroughly used up but it's a good log for keeping track of what's leaving your stash. I was on the verge of finishing quite a few tubs and tubes in December so I thought I would just wait until the end of January to include those. Pictured above are the things I used up in Korea and tossed before returning home. The Ojon Rare Blend Deep Conditioner was an effective hair treatment that softened my color treated hair. I can't say the same for the L'Occitane Aromachologie Shampoo and Conditioners which cleaned my hair but didn't quite repair it in any way. The conditioner was especially light so I had to use quite a bit of it to untangle my hair. After towel drying my hair I use a bit of the Bumble and Bumble Hairdresser's Invisible Oil which was a basic hair oil. It was pretty much undetectable in my hair and I think it added just a touch of shine and moisture to my hair. I polished off The Body Shop's Honeymania Body Butter which I love and will be repurchasing in the future. I've raved about it a few times already so I won't go on and on about it here. I used the Lancome Genifique sample as my nighttime serum while in Korea and it was comfortable and easily absorbed but I don't think I will purchase a full size. The Maybelline Colossal Waterproof Mascara is a repurchase and one I will continue to buy as long as they make it. Maybelline waterproof mascaras hold a curl like no other and give me great length and just enough volume. Someone even asked if I was wearing false lashes one day when I was wearing this mascara by itself! I also finished the KIKO Soft Focus Concealer which is a highlighting concealer. It gave very light coverage but I truly enjoy the ease of pen style concealers. A few quick swipes under the eyes and on key areas of the face, a few swirls with a brush to blend out the edges and my skin looked instantly better. 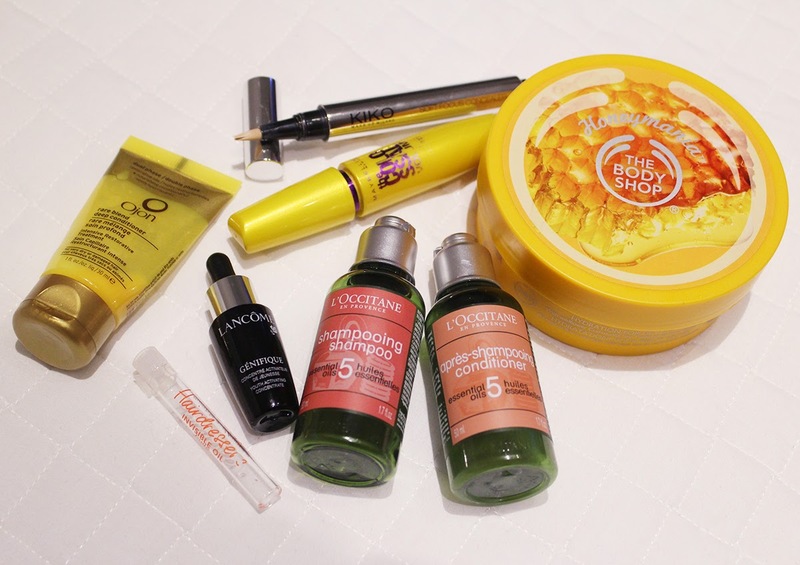 Here are the things that I had waiting at home for me to finish as well as a handful of products that I finally had the nerve to toss due to old age. I have a bunch of mini Lush tubs from purchasing their holiday gift sets. 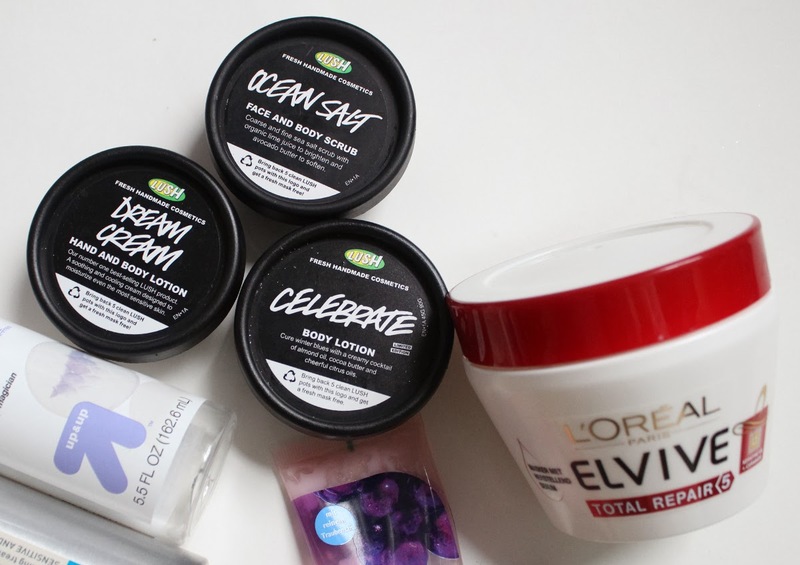 These were all products that were new to me so I wanted to get small versions to try before investing in the full size. Ocean Salt is a good body scrub and I have another little pot of this but I don't think I'll be buying a whole tub soon because it's quite pricey. Dream Cream is a really nice soothing lotion for sensitive skin. I would consider buying a full size of this because my skin is very dry and irritated during the winter and this moisturizes without being too greasy. Celebrate was a limited edition lotion for the holidays and I love the smell of this with Rose Jam Shower Gel (also LE) so I already bought a full size of this back in December. I finally finished the L'Oreal Elvive Total Repair Hair Mask that I bought ages ago in Amsterdam. I really liked this hair mask as a conditioner and felt that it softened my hair a lot. I'm using another L'Oreal hair mask that I bought from Amsterdam (with a yellow cap) but it's just not as good. I really love the Melvita Damask Rose Floral Water for the beautiful scent but I don't know if it's that much better than just rose scented witch hazel to justify the price. The Za True White Prismizer is a whitening toner that I bought in Singapore. There is a bit of alcohol in the formula which I know is taboo for beauty bloggers but I thought it was a decent product that didn't sting my face. The Phyto Soothing Treatment Shampoo didn't lather much and had a somewhat unpleasant scent but it still cleansed my hair. I only bought it because it was cheap in Paris but I wouldn't purchase it again considering the Sephora prices in the States. 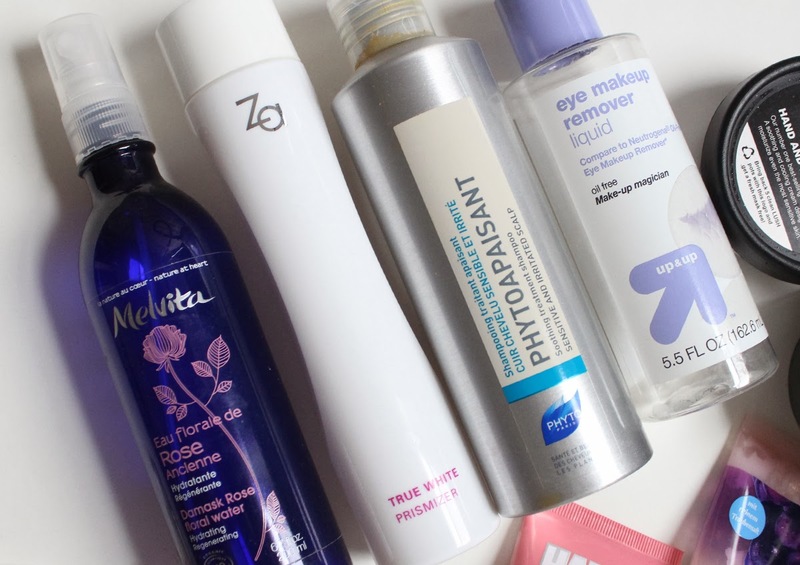 I used up yet another bottle of the Up & Up Eye Makeup Remover from Target which is the cheapest eye makeup remover that does a good job. I already had a back up bottle in my stash and will continue buying this until they stop making it! 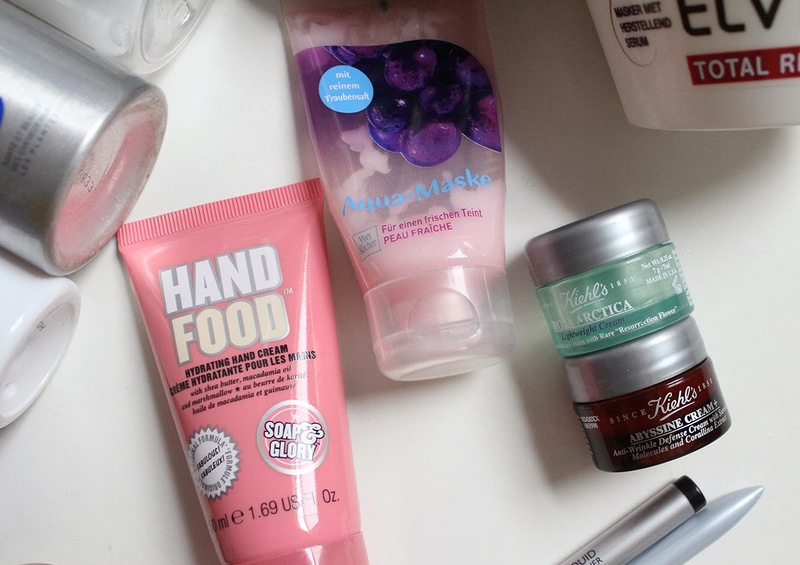 The Soap & Glory Hand Food Hand Cream was a disappointment because the scent is way too cloying and strong. I only used about a quarter of the tube and passed it to my mom who likes the scent. The Yves Rocher Grape Aqua Mask was a fail like the Pomegranate one I talked about in another empties post so I used it as body lotion. I used up the Kiehl's Rosa Artica Cream and Kiehl's Abyssine Cream+ when I traveled and I also kept them in my gym bag. Both were decent moisturizers but nothing impressive that would warrant a full size purchase. 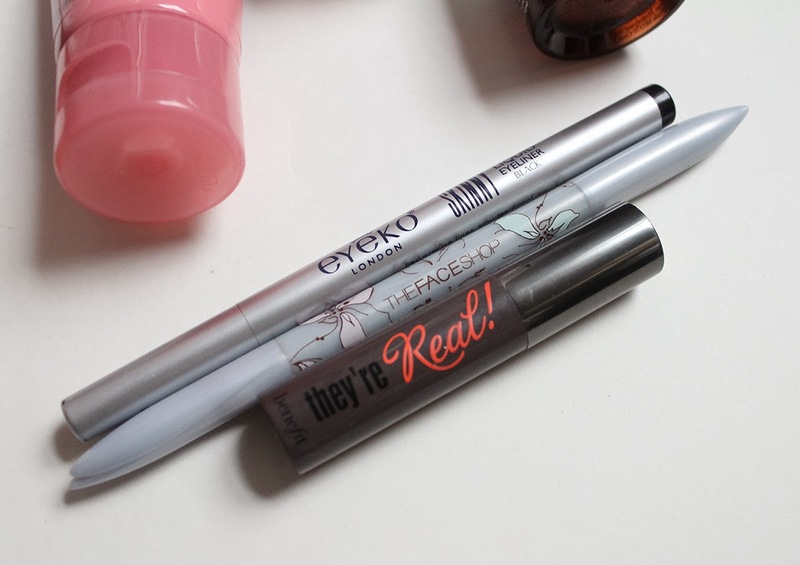 My trusty Eyeko Skinny Liquid Eyeliner finally dried up and I was almost sad to see it go. The firm felt tip was super easy to maneuver and it suited my eyes very well. I would consider repurchasing it. I used The Face Shop's Auto Eyeliner as an eyebrow pencil due to it's waxy formula and am happy to bid it goodbye. I think it was the second eyeliner I ever purchased and I don't want to think about how old it is.... I'm binning a sample of Benefit's They're Real Mascara because I've had tried using it for over six months probably and it doesn't do much for my lashes. It can't hold a curl at all and that's the most important criteria for me in terms of a good mascara. 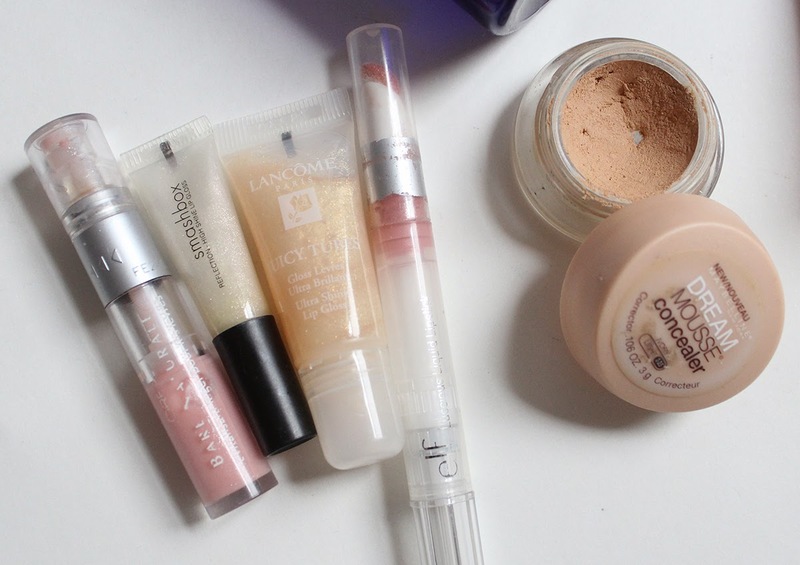 I rutted through my lipgloss collection and scooped out a few very old products that are probably past expiration to throw out. I have a hard time throwing out makeup because I can see my waste first hand but I guess it's consolation knowing the Smashbox and Lancome glosses were gift with purchases and the other lipglosses were drugstore ones. I'm also tossing a Maybelline Dream Mousse Concealer because I got it when CVS was doing their clearance sale and I think the concealer made me break out due to being old. One of these days I WILL have an empty blush compact or eyeshadow pan to show you.... One day.... But until that day comes, feel free to share what products you have finished lately!